These three bring so much joy, happiness and color into my life it is unbelievable. Except when it’s time to empty the dishwasher, but that’s a whole other story. So for the Noel Mignon Spring Fling Crop “Somewhere Over the *Rainbow* Challenge” I knew exactly which picture I wanted to use. I started with the October Afternoon papers found in one of my older Noel Mignon kits and then dove into my rather large October Afternoon button stash. I love that I also found a coloring page card in the Sidewalks Miscellany pack, since it goes perfectly with my theme. Don’t worry, I still have plenty of buttons left. Maybe I’ll use those when there are happy times unloading the dishwasher. Like that will ever happen. He he. I love the rainbow of buttons! What a great layout! Great layout! I just love all the memories that you preserve. Yeah, I think your buttons might be safe : P !!! 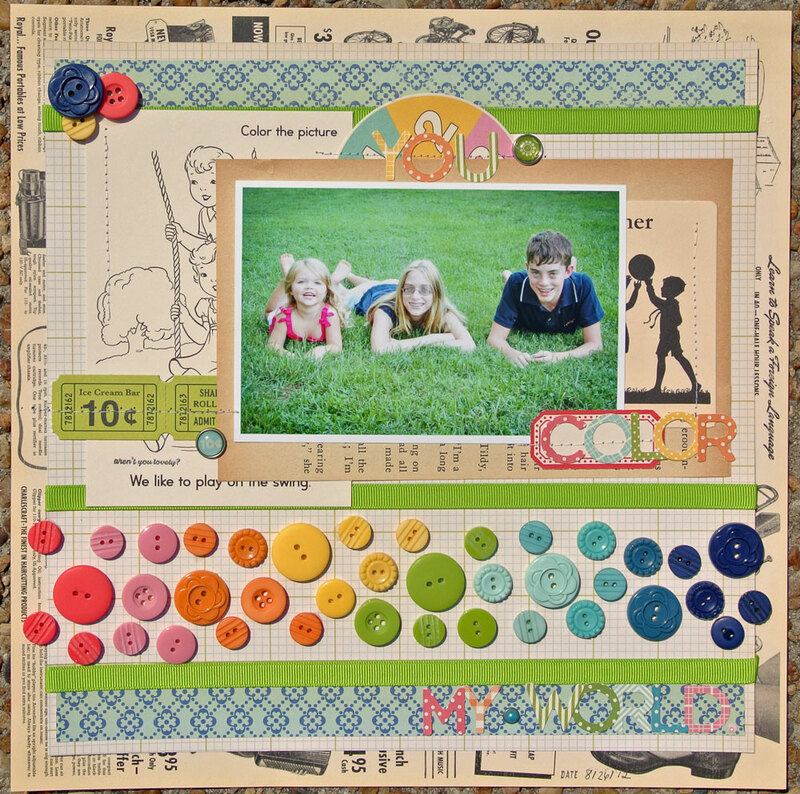 This is an AWESOME layout & I envy you all the purdy colors of buttons you have…my button stash is mostly all dark colors; I started collecting them from antique stores, etc when we lived in Nebraska. Maybe I should start collecting some new, brighter colored buttons????!! Gee, Thanks, another collection that I must have! !